DO NOT CLICK 'BACK' IN YOUR BROWSER. IF YOU WISH TO NAVIGATE BETWEEN PAGES, PLEASE DO SO WITH THE BUTTONS AT THE BOTTOM OF EACH PAGE. IF YOU CLICK 'BACK' IN YOUR BROWSWER YOU WILL LOSE ALL DATA AND NEED TO START OVER. USA Rugby is looking for 4 to 8 venues to host a regional playoff for a Men’s DI-AA and/or Women’s Division I and II collegiate playoff event. Each location would host 4 to 12 teams total, depending on the geographic needs of the bracket and the availability of quality venues, on April 25-26 or April 26-27 (bracket dependent). Priority will go to a venue that has either a qualified team in the area or is central to the potential qualified teams. Additional priority will go toward venues that are within one hour from a major international airport and can provide affordable accommodation and transportation for teams. USA Rugby prioritizes affordability for traveling teams and will not require teams to stay in designated hotels. Please Note: All potential revenues - tickets, merchandise, concessions, local/event specific sponsorships, hotel commissions, etc - are the sole property of the Host. Please Note: Alcohol sales are prohibited at College events. Please Note: Alcohol, Tobacco, and Gaming sponsorships are prohibited at College events. Exact field dimensions can be found here: http://www.irblaws.com/index.php?law=1. Please upload (or send separately) the exact dimesnions of the proposed venue, including any surrounding structures or landscape changes (i.e. buildings, stands, berms, slopes, ditches, etc.) within 10 meters of the playing surface. Goal Posts – Hosts are responsible for ensuring that the match field and any subsequent back-up fields have IRB regulation goal posts. Exact dimensions for regulation posts can be found here: http://www.irblaws.com/index.php?law=1. USA Rugby will provide goal post pads (4) and field flags (14). Field Lining – Hosts must ensure that the match field is lined in accordance with IRB regulations. Dimension can be found here: http://www.irblaws.com/index.php?law=1. Perimeter Signage – (See below schematic for more information) Hosts are responsible for the set-up and take-down of the perimeter signage.A sample of previous signage is laid out below. All signs are vinyl banners and are provided by USA Rugby. All signs measure 3 feet high by 20 feet long. The layout may change based on new sponsors acquired by USA Rugby and the Host. Please note, USA Rugby will not pay for or provide signage for local/Host specific sponsors. TV Platform – If the Host elects to film, USA Rugby requires that all filming must be done on a raised platform (minimum of 15 feet) at mid-field. The Host must provide scaffolding if a permanent platform is not available. If you answered yes, how high is the platform? Training Field – Hosts need to provide 1 training field per 4 teams participating, of the same surface as the match field (i.e. grass training fields for grass match fields), for teams who arrive early and wish to train. These fields need to be lined for rugby but posts are not required. They do not need to be located at the same venue as the event but within 30 minutes of the team hotel area. Teams will schedule training times through the Host, not USA Rugby. If teams do not request trainings this is not required. Teams will have up to one week before the event to reserve trainings. Warm-up space – For match days, USA Rugby requires that there is adequate space for teams to warm-up on before their games. This space needs to be close to the match field. Teams kicking off first are able to warm-up on the match field. Warm-up space does not need to be lined but it is preferred. If locker rooms are available, approximately how many? 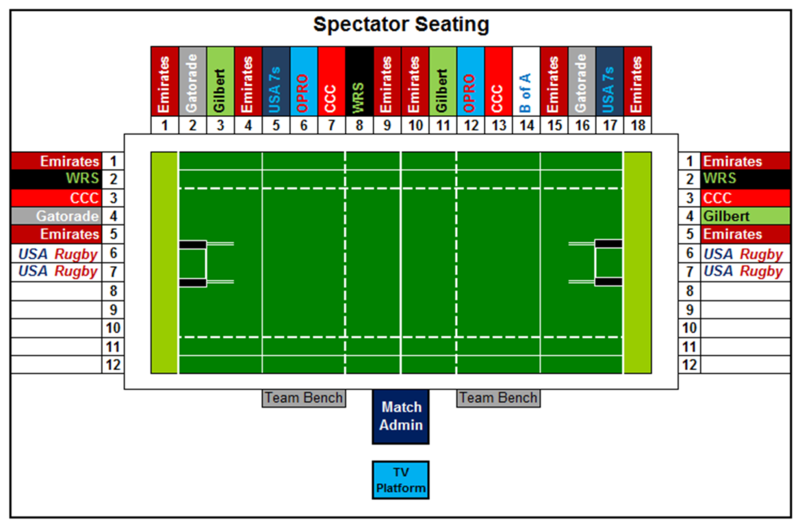 Team Benches – (See above field layout for more information) USA Rugby requires seating for teams during their games. Two team benches located outside the safety perimeter away from spectators are required. Teams need to be on the same sideline for competition and match management purposes. Match Administration – The area located between the team benches is designated for officials. At a minimum, this area needs to be covered (i.e. 10x10 tent) with a table and 4 chairs. This area is for the game’s Match Officials, the #4 Referee (substitutions, official scoring), and medical personnel. The scoreboard, operator, and PA system may be located here as well. Hosts must provide a scoreboard and scoreboard operator. Spectator Accommodation – Hosts are responsible for providing suitable spectator accommodations – seating, restrooms, and parking. Additional Amenities – Hosts are responsible for providing suitable spectator accommodations – seating, restrooms, and parking. Is there anything else you would like to include in your bid regarding the venue? Ambulance – An Ambulance with either an EMT and Paramedic or 2 Paramedics must be on-site and dedicated to the field beginning one hour before the first kick-off and a half-hour after the last match. If the Host fails to book an ambulance, USA Rugby will hire an ambulance at the Host’s cost entirely. For collegiate events, USA Rugby may provide a grant to cover some or all of the costs involved. Please contact the College Dept. to apply for a grant for ambulance/paramedic costs. Trainers - A minimum of one dedicated Certified Athletic Trainer (ATC) per active field is required. These personnel must be on-site beginning one hour before the first kick-off and a half hour after the last match. Player Recovery/Medical Accommodations – At a minimum, the Host must provide a 10x10 medical tent, two 6- or 8-foot tables, 4 chairs, 200/lbs ice per day (for water, not injury) and a constant supply of water. USA Rugby will send 4 Gatorade drink coolers and 3 Gatorade ice coolers to help store these items. Please note that 2 of these drink coolers must be located on the team benches, 1 cooler is reserved for the Match Officials area and 1 is reserved for the medical area. If Gatorade products are not allowed at the venue, the Host must provide 4 water coolers and 3 ice coolers. Is there anything else you would like to include in your bid regarding the Medical Services? Score Reporter – USA Rugby needs all rosters, substitutions, and results to be loaded into the USA Rugby Competition Management System. Rosters will be entered by teams prior to kick-off and in many cases the #4 Match Official will enter the scores and substitutions into the system in real time. However, if the #4 uses a hand-written paper score reporting form, we need someone to enter the scores during or as soon as possible after the match. Ball Runners – USA Rugby requires at least 2 ball runners per game, per field. They can be the same individuals for the whole day or multiple individuals in shifts. Ball runners must wear the USA Rugby volunteer t-shirt (provided by USA Rugby), athletic shorts and comfortable shoes (ball runners cannot be barefoot). For the purposes of this event, ball runners must be 12 or older and have some knowledge of rugby. Operations Crew – USA Rugby requires at least 2 operations crew members at all times. In addition to helping the Host with set-up and take-down, the operations crew must make sure sideline, medical, and referee water and ice are filled and refilled at all times. Camera Operators – If you wish to film games, USA Rugby recommends at least two individuals switching off. Photographer – The Host must provide a professional photographer, either volunteer or hired. USA Rugby will not reimburse for photographer costs. All photos need to be available for USA Rugby’s use in digital formats. Miscellaneous Volunteer Positions - The Host will need volunteers for other positions - this may include scoreboard operator, ticket takers, concessions, merchandise, set-up/take-down help, parking attendants, etc. Financials - The Host is required to submit a budget of all costs and potential revenue to USA Rugby once the event is awarded. Additionally, the host is required to submit a progress budget to USA Rugby one week before the event kicks-off. Lastly, the host is required to submit a final budget, showing all costs and revenues to USA Rugby within 60 days of the event's conclusion. This information will be used to determine if these events are profitable in the current model moving forward. Meeting Space - USA Rugby holds a Coaches and Captain's Meeting the night before the event. The meeting will last approximately one hour. The Host needs to provide a room at the venue or nearby for approximately 25 people, set-up theater style, from approximately 7-8pm the Thursday night before a Fri/Sat event or the Friday night before a Sat/Sun event. If there is not a room at the venue, USA Rugby and Host will work together to find a meeting space at one of the team hotels. The cost will be the Hosts unless it can be leveraged against guest rooms. Team Hotels- The Host is required to find and block hotel rooms for teams with at least 4 local hotels. We recommend that the Host blocks no more than 25 double rooms at each hotel. All hotels should be within 25 minutes of the venue and have rates of less than $100 including tax/night/room. These hotel details are needed at least 3 months prior to the event's kick-off and must include name, address, rate, contact details, and any required codes to access the blocks. Team Hotels- The Host is required to find and block hotel rooms for teams with at least 4 local hotels. We recommend that the Host blocks no more than 25 double rooms at each hotel. All hotels should be within 25 minutes of the venue and have rates of less than $100 including tax/night/room. These hotel details are needed at least 3 months prior to the event's kick-off and must includ name, address, rate, contact details, and any required codes to access the blocks. Match Official Accommodations - USA Rugby covers all Match Official travel, hotel, transportation, and kit. Free admission and parking for all match officials (approx. 15-20); Free lunch vouchers for concessions or sandwiches brought in each day; Approx. 48 bottles of water (24 bottles/day); Large Tent/Covered Area close to the match pitch exclusive for Match Officials; 2 tables and 10-15 chairs. *Please note that the numbers listed above are for an 8-team event; numbers may vary depending on the size of your event. Please confirm with USA Rugby prior to accepting your bid the exact numbers necessary for your event. Is there anything else you would like to include in your bid regarding Match Official Accommodations? Printed Material - The Host will be required to print a bracket board - artwork will be provided by USA Rugby but the printing is at the cost of the Host. USA Rugby will ensure that the cost of this will not exceed $100. If the Host elects to print any other materials, it is at the cost of the Host. Please note that if the Host chooses to print tickets, the Emirates Airline logo must be printed on the front (artwork provided by USA Rugby, printing is the cost of the Host). 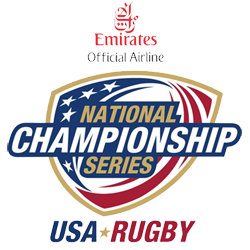 If the Host elects to print Credentials for teams, match officials, staff, and volunteers, the USA Rugby Championships Logo must to be printed on the front of the credentials (artwork provided by USA Rugby, printing is the cost of the Host). Emirates Logo on front page of program front (artwork provided by USA Rugby, printing is the cost of the Host); Emirates Logo on fixture page front (artwork provided by USA Rugby, printing is the cost of the Host); 1 full page color advertisement for Emirates Airline (artwork provided by USA Rugby, printing is the cost of the Host); 1 full page advertisement for Gilbert (artwork provided by USA Rugby, printing is the cost of the Host); 1 full page for AIG; 2 full pages for USA Rugby (artwork provided by USA Rugby, printing is the cost of the Host). Is there anything else you would like to include in your bid regarding printed materials? Thank you for taking the time to complete the bid document! If there are any additional questions, you may enter them below or contact Erik Geib at egeib@usarugby.org or 303-539-0300 x118. USA Rugby will be accepting bids until November 8th, 2013. It is expected that spring venues will be selected and announced by December 6th, 2013.